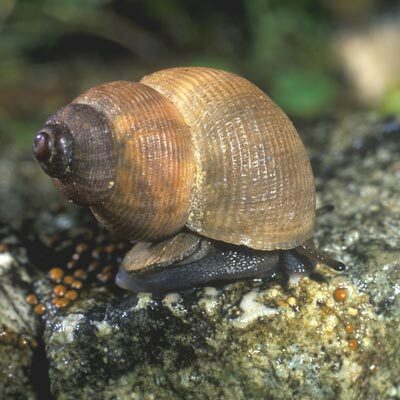 A medium-sized, pinkish to reddish-brown shell with darker apex. Very solid with a strong sculpture of spiral striae crossed by broad radial grooves. Aperture closed by a thick, horny operculum. A southern species in Europe ranging from southern Denmark to the Mediterranean but strangely lacking in Iberia apart from outlying colonies on the coast of Portugal and the Balearic islands. Distribution type: European Southern-temperate (83). In the nineteenth century there were a small number of artificial introductions of this species to Ireland which evidently did not take. However, Thompson (1842) regarded the finding of “fully a hundred” shells washed ashore at 'Mullaghmore' near Bundoran, East Donegal, as reliable evidence that the species was indeed indigenous. In 1976, a small colony of live animals along with subfossil shells was located near New Quay on Finavarra on the north coast of Co. Clare (Platts, 1977). The species is now regarded as a long-established but relict native in Ireland. The nineteenth-century occurrence of shells at Bundoran, roughly 100km north of New Quay, has never been satisfactorily explained. However, Cawley (1996) refers to a dead shell recently found by Dr D.C.F. Cotton in Bunduff Dunes, Co Sligo, which is close to the probable Mullaghmore site referred to by Thompson. No living shells have ever been found in this area. Anderson, R., (2016). Pomatias elegans (O. F. Müller 1774). [In] MolluscIreland.